FOUNDING National University of Science and Technology (Nust) Vice-Chancellor and distinguished academic Professor Phineas Mogorosi Makhurane has died. 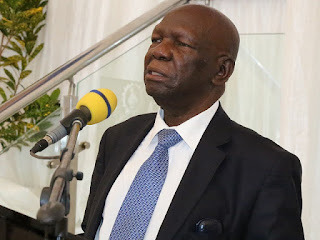 Prof Makhurane, one of the first Africans to study Physics and Mathematics at the then University of Rhodesia and Nyasaland now University of Zimbabwe passed on yesterday. As news of the fall of the academic giant filtered throughout the country, messages of condolences poured in with Nust Vice-Chancellor Professor Mqhele Dlodlo describing him as an academic giant whose grounding in education was immense. He said among his academic achievements, Prof Makhurane was the first to introduce industrial attachment in universities in southern Africa that replaced vacation training. “It’s much more than what I can comment on him. I first knew him when I was still at High School and he was at University of Zimbabwe. He then became the inaugural Vice-Chancellor of Nust where I later worked under his leadership. He was at one time the chairman of Zimsec and was chairman of the Gwanda State University Council,” said Prof Dlodlo. He said it was him who did an excellent job in putting Nust on a solid academic grounding. Prof Makhurane once worked as Pro Vice-Chancellor of the University of Zimbabwe before being given the mammoth task of leading Nust where he worked tirelessly in setting up the infrastructure and the turning the institution into a place of academic excellence. He retired from Nust in 2004. At some point he served as Zimsec board chairperson.